When I made my first Bellatrix back in January, all went fabulously well until I got to the part where you insert the sleeves into the armhole. I don’t usually have an issue with this part, so wasn’t expecting anything major to happen, especially as the rest of the construction had passed without incident. But – the sleeve head did not fit the armhole! Usually you need to ease the head into the armhole, for practical purposes, you need fullness in that space for ease of arm movement. The back fitted in just flat – no ease at all, but the front! The front… the sleeve head from the front notches to the top point/shoulder point was far too small. I ended up having to stretch the sleeve to fit the armhole – not exactly the normal way to do this! Not in the mood for massive adjustments, I simply cut my next version (the Paris print cotton canvas) a little wider on the sleeve front. It worked fairly well, mostly because the cotton canvas has some give. I kept the same adjustment for the third Bellatrix, but as this was made using a wool/poly blend with no movement at all, it didn’t work. I knew I’d have to do a better fix, so this is what I did. First I measured the armscye of the jacket, front & back. In the (adjusted for wider shoulders) XXS this measurement is 45.6cm. I compared this with the measurement of the sleevehead – 43.7cm. Now there is the problem. You cannot fit a sleeve into an armhole properly if the sleeve is 2cm smaller than the armscye! It should be at least 2cm BIGGER! Next I checked the sleevehead depth. 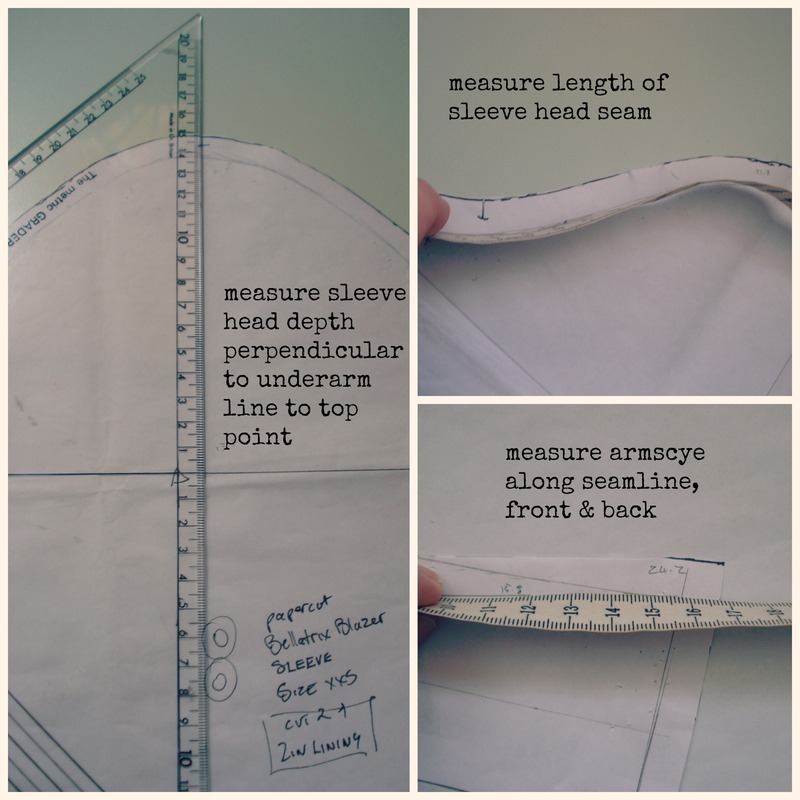 This is measured perpendicular from the underarm line to the top point of the sleeve, and should be one third of the armscye measurement. Bellatrix is lacking 1cm in this department. 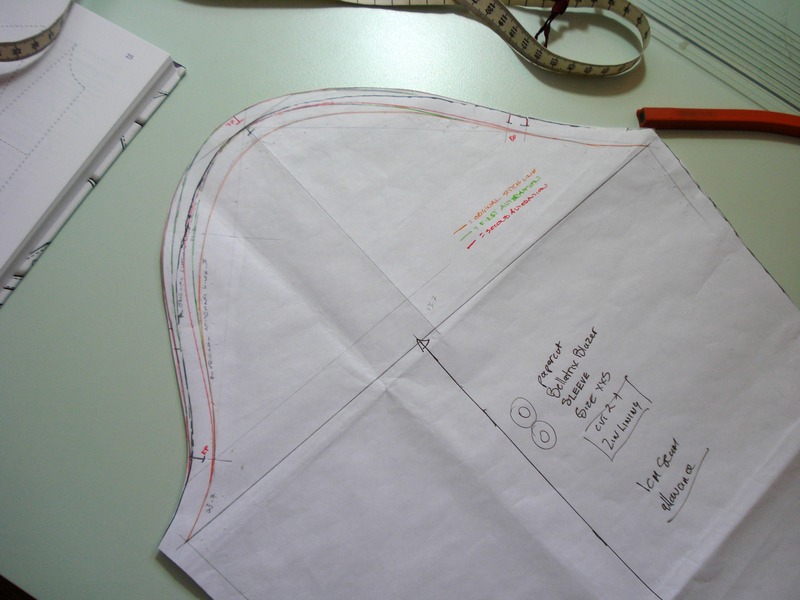 Now different pattern cutting books will give you differing amounts of ease they require for the drafting of the sleevehead, but in the end it all depends on the current fashion, and of course, the style of the garment. This one obviously does not require masses of ease, we want a smooth fit. Also, there are no shoulderpads, so we really don’t want to add too much or we’ll get floppy shoulders. I started by raising the sleevehead the 1cm missing from the depth. 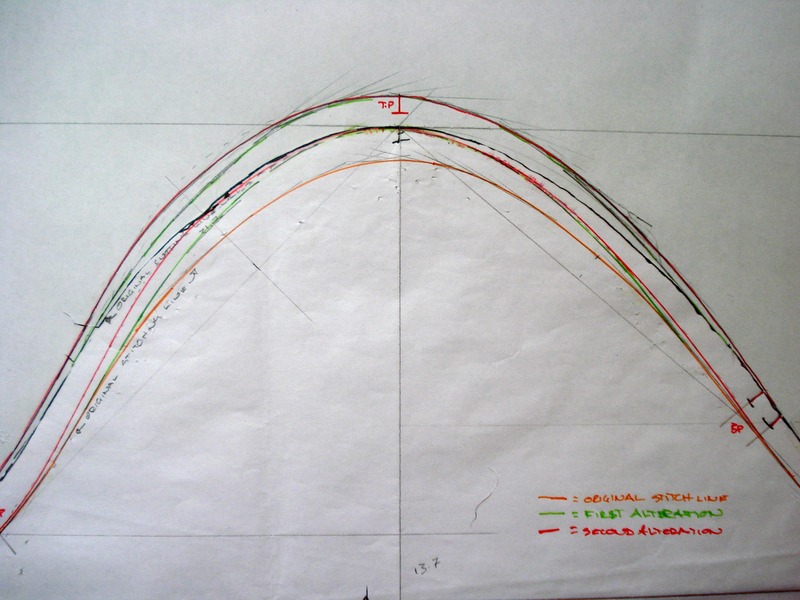 I drew a new line from the front notches to the new top point & back down the the back notches (green line in the photograph below). This new line gave me a measurement of 45cm, still not enough. But I didn’t want to make it too much bigger. I tested this new sleeve & found the back was just fine, the little more added made for a more comfortable ease, but the front still needed work. So I made a little more room (completely un-scientifically) in the front from notches to top point & it worked! This new line is the red one in the photograph above. Weirdly, the measurement of sleevehead & armscye are the same, but all fits properly. 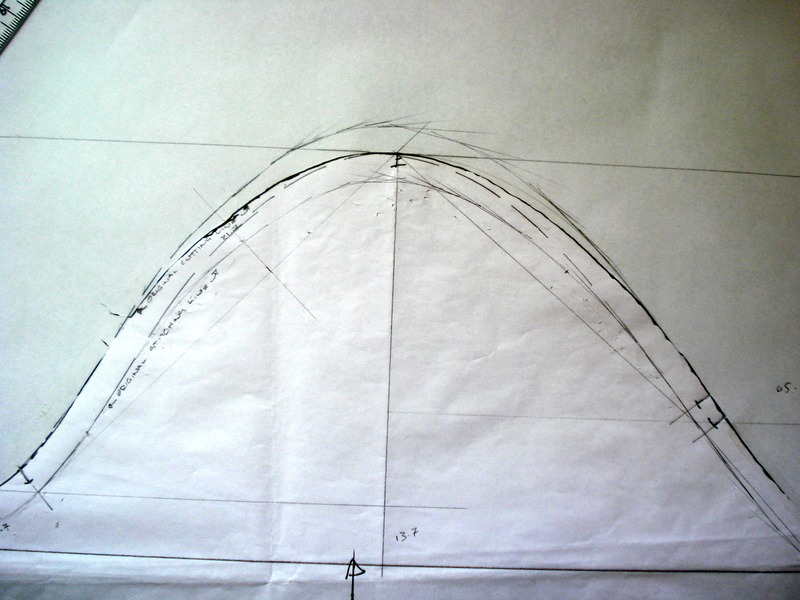 I think its all down to the method used when drafting the original pattern. I thought I’d try draft a one-piece sleeve using Winnie Aldrich’s method & the jacket front & back pieces. It came out way wider (almost 6cm) than Bellatrix’s, making it flatter overall, wider in the arm & much less flattering. So I will stick with the now more pointy sleeve & see how I get on. For now, this alteration seems to work for me. I used it in the linen jacket & had a good, smooth insertion with no dragging, so what the heck. It may not look like I expect it to, and it certainly doesn’t have the measurement I expected, but it goes in without fuss. Until I try this with a fabric without give…. If you want to give this method a try, let me know whether or not it’s worked for you. If it works don’t question why too much – sometimes you just have to go on instinct. I think a slender sleeve is very flattering and less ‘fattening’ than one with too much top arm ease. Well done on finding the solution to your sleeve problem. Oh definitely! If you start to over think it, it all goes to pot! 🙂 This is a nice slim-fit sleeve, no point messing too much. I just just have weird shoulders! 🙂 Actually I did not intend to use shoulder pads (I am a child of the eighties and therefore allergic to them) but when I tried some light-weight ones I had in my stash they really improved the fit. I think my bellatrix was a little broad in the back, I took in the back seam a little and adding the shoulder pads finished it off. I’m pretty sure my pattern making teacher would approve of this method. I haven’t heard of many people with the issue, none of the testers commented on a problem either so…. I have cut another. How many Bella’s can I make in a year?? Previous Previous post: Sewing double – twice!